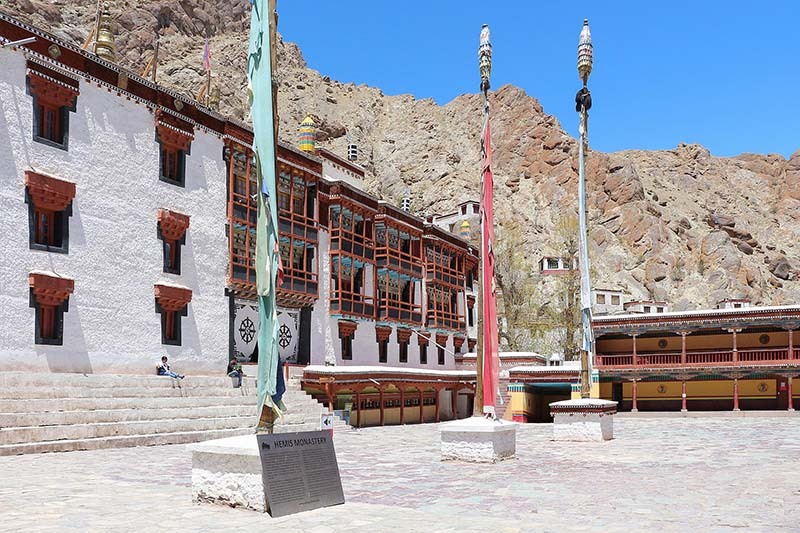 The thing about Monasteries in Ladakh is that not only they are religiously important, but are also one of the most visited tourist destinations here. A trip to Ladakh is incomplete unless you have been to its grand and magnificent monasteries. These ancient and hundreds of years old structures attract a fair share of visitors each year. Some people even keep a day in their itineraries for the ‘monastery tour’ in and around Leh. Even if you are not able to do so and cover a whole lot of them, I will still strongly recommend that you visit at least one monastery during your trip. This way, you would have visited and paid respect at a religious place; and gain an important insight into the lives of Ladakh people. One monastery that I will be discussing in this article is the beautiful Hemis Monastery of Ladakh. This article is the second in a series, in which I have discussed in detail the local tourist attractions of Ladakh. The first article talked about Gurudwara Pathar Sahib and how you can plan a trip there; either from City or while traveling to or from Srinagar. Hemis Monastery is located about 40 kilometers away from Leh city and at an altitude of 3,524 meters (11,562 ft). It was re-established in 1672 by the Ladakhi king Sengge Namgyal but has been in existence even before the 11th century. The monastery has quite a bit of an interesting history and also a controversial theory related to it. It is ranked as one of the wealthiest monasteries not only in Ladakh but in all of India. Naropa, the pupil of Yogi Tilopa and the teacher of the translator Marpa, is said to have laid the foundation of this monastery in ancient times. Naropa is also considered as the founding father of the Kagyu-lineage of the Himalayan esoteric Buddhism which makes Hemis as the main seat of the Kagyu lineage of Buddhism. Hemis has more than 200 Branch Monasteries in the Himalayas and has more than 1000 monks under its care. In the 19th century, Hemis monastery faced a siege by General Zorawar Singh. It was only because the head lama back then was able to negotiate and handle the situation skillfully because of which the monastery and its monks were saved from the invasion. Hemis is in fact believed to be the only monastery in Ladakh that has never been plundered. In the year 1956, the head lama of this monastery disappeared mysteriously without a trace. He was never found or seen again by anyone. After his disappearance, a 12-year-old Boy was brought from Dalhousie and appointed as the Head Lama. Hemis Monastery has been under the patronage of the Royal Family of Ladakh ever since it was re-established in the 17th century. It is the headquarters of red hat Drukpa order and all the monasteries in Ladakh are administered from here. It is also the place where young Lamas train for the Royal monasteries of Leh, Shey, and Basgo. There is also another legend related to Hemis Monastery which is now largely considered to be a hoax. In the year 1894, a certain Russian journalist by the name of Nicolas Notovitch claimed Hemis as the origin of an otherwise unknown gospel, the ‘Life of Saint Issa, Best of the Sons of Men’. Isaa is another name of Jesus Christ and in this gospel, Jesus is said to have traveled to India during his ‘lost years’; the period of Jesus’s life between his childhood and the beginning of his ministry. Notovitch said that the work had been preserved in the Hemis library, and was shown to him by the monks there while he was recovering here after a fracture in his leg. This story, however, is said to have been a fake one with Notovitch confessing in his later life to have fabricated the evidence. Hemis Monastery is located 40 kilometers south of Leh City, a little off the Indus river road near Karu. In order to reach Hemis Monastery form Leh, you will have to travel towards the small town of Karu on Manali Leh Highway. In Karu, you will reach a Junction where the road towards your left will take you to Pangong and the one on your right will go towards Hemis Monastery. Ask the locals there if you weren’t sure of the diversion and anyone can point you in the right direction. You will have to cross over the Indus River and travel about 7 kilometers from Karu to reach the monastery. As you travel from Leh to Karu, there are a couple of other places as well when you can cross over the river and come to its right to reach Hemis. My recommendation would, however, be that you stay on the Manali Leh highway till Karu and then turn to your right. The road on this route is better and slightly shorter as well. There is a bus that travels from Leh to the village of Martselang; and it goes via Changa and Hemis. This bus starts from Leh at 8.30 in the morning and arrives at Martselang at 9.30 AM. For the return journey, this bus leaves Martsellang at 4.30 PM and arrives at Leh at 5.30 PM via Changa and Hemis. If this timing suits you, you can travel by this Bus. Otherwise, you will have to either rent a private taxi, motorcycle or an automatic bike like Scooty from Leh. Another great option would be to just hitchhike which you definitely can during tourist season. Hemis Monastery is located at an altitude of 3,500 meters (11,482 ft). Is there a permit required for visiting Hemis Monastery? No, you do not need to obtain a permit for visiting the monastery. You can just reach there, buy the ticket and enter. Inner Line Permit is in fact not required to visit anywhere in Leh City. It is only needed when you travel from Leh to other areas of Ladakh like Nubra or Pangong. The visiting hours of Hemis Monastery and Museum for tourists are from 8 AM to 1 PM and 2 PM to 6 PM. The Monastery remains closed from 1 PM to 2 PM and you can visit here on all 7 days of the week. It is open even on all public holidays. The entry fee for Hemis Monastery is Rs. 50 per person, which is actually slightly higher as compared to other monasteries. The entry fee and ticket is said to be only for the museum but you will have to buy it nonetheless, even if you do not want to go to the museum and visit only the monastery. Once you are inside the monastery, you will immediately know why it is claimed as the richest monastery in India. It houses quite a few gold statues and Stupas decorated with precious stones which are its biggest tourist attraction. It also has a large collection of Thangkas (Tibetan Buddhist painting on cotton, silk appliqué, usually depicting a Buddhist deity, scene, or mandala). There is one Thangka here which is said to be the largest one in existence and put on display only once in every 12 years. The Hemis Monastery is divided into two sections. The assembly hall is known as Dukhang and the temple is known as Tshogkgang. The ticket you will be provided with will have a small map of the monastery printed on it to help you navigate your way. The main assembly hall is marked as 1 in the map on the ticket. This hall is called Dukhang Chenmo and it houses an idol of a fierce protector called Gyalpo; who is believed to look over the entire Hemis Monastery. This idol represents the highest and the most powerful form of Buddhism, tantric Buddhism. The second assembly hall, called Dukhang Barpa, is marked as number 2 on the ticket and has an idol of a peaceful golden Buddha. On the upper floor of the monastery, there is also a huge statue of Guru Padmasambhava; also known as Guru Rinpoche. There are several other small temples in the monastery premises and will be marked on your ticket itself. While you are here, I will strongly recommend that you visit all of them. Before leaving the monastery, climb up to its roof and enjoy an amazing view of the area around. You will also get to see a Lord Buddha statue mounted on the front hilltop of Hemis. The Hemis Monastery also has a museum which is reputed to be as rich as the monastery itself. The museum will be to your left as you climb up the stairs and enter the monastery. It houses a large collection of historical Buddhist Thangkas, weapons, artifacts and carriers. There is also a library here that has an awesome and massive collection of Tibetan Books, manuscripts and relics. At the ground floor of the museum, there is a small shop that sells several souvenirs like items; like books, T-Shirts, trinkets, and Ladakh magnets. Photography is strictly prohibited inside the museum. There is another sacred hermitage a little further from Hemis founded by Gyalwa Kotsang. It is a pleasant 3 kilometers walk, on the side of the mountain above the monastery. Here, inside a cave, you can find the footprints and hand prints of Gyalwa Kotsang on the rock and sacred shrines. A lot of Ladakhi people visit here to pay their respect. The Hemis Festival celebrates the life of Lord Padmasambhava (Guru Rinpoche) whose life mission, it is said, was to improve the spiritual condition of all living beings. It is celebrated on Guru Rinpoche’s birthday which interestingly falls only once in every 12 years. The festival takes places in the rectangular courtyard in front of the main door of the monastery. A number of musicians play traditional music with four pairs of cymbals, large-pan drums, small trumpets, and large size wind instruments. The festival is marked with the mystic mask dances by the lamas; referred to as ‘chams Performance’. The festival and the rituals begin early in the morning to the sound of drums, cymbals, and pipes. The portrait of “Dadmokarpo” or “Rygyalsras Rinpoche” is ceremoniously put on display for people to admire and worship. Mask dances by the lamas of Hemis monastery are held and the festival is concluded with a sacrificial offering on the second day. During the sacrifice a sculpture made up of dough and representing the evil powers is destroyed by the head of Black Hat dancers as a representation of warding off the evil spirits. The broken pieces of the sculpture are then thrown in four different directions. The amazingly vibrant silk costumes used by Lamas as they dance along with long horns and musical drums during their performances are a feast for eyes. Hemis festival is celebrated in the month of July and it’s date changes every year. For the year 2019, it will be celebrated on July 11th and 12th. For the year 2020, it will be celebrated on June 30th and July 1st. The monastery has the option of an overnight stay for tourists. Please note though that the accommodation here is very basic so do take a look before you decide to check in. Do not expect a luxurious hotel like stay and for some people, it may even be a little uncomfortable. If you still wish to stay here for the night, you can inquire about it at the museum inside the monastery. If for some reason you could not find a place to stay at the monastery, you can look for a hotel or guest house at Karu. The stay option at the Monastery is known as Hemis Monastery Guest House. The building is separate than that of the monastery so you are not really staying in the monastery but in a guest house run by the monastery. There are a total of 4 floors in the building and the rooms are not really that well maintained. The worst part, however, are the washrooms. Each floor has just one washroom and all of its occupants share it. Heed my warning, before you decide to stay at the guest, check the washroom. In fact, check the washroom first and then the room. Chances are that the very sight of the washroom would have you change your mind about staying here. The rooms and the bedding will be just about OK in terms of cleanliness. The charge of staying at Hemis Monastery is Rs. 900 per room. This fare is increased to Rs. 1800 per room during Hemis Festival. Another important thing you must know is that the monastery guest house has no kitchen so if you stay here, you will have to eat out. If you were already thinking that Ladakh is a bit too cold for you then you must give up the idea of staying at the monastery. Temperature here is a little colder than Leh City and given the conditions of the room and the blankets, you will not be as comfortable and warm here as you will be at some other commercial hotel. There is a small restaurant or pantry in the monastery where some refreshments like tea and biscuits are served. For proper meals, however, you will have to step out of the monastery and eat at the restaurants near it. For a better menu, you can go to Karu and have your meals there. The best time to visit Hemis Monastery would be around the dates of Hemis Festival; which can be either in June or July. This way, you get to see the monastery all decorated for the grand celebrations ahead. If you could not visit around Hemis Festival, then any time is a good enough time. The road from Leh to Hemis opens throughout the year, including the winter season. So the only thing you got to worry about is when you can manage to visit Ladakh. But irrespective of the month you visit here in, Hemis Monastery will always be a charming experience. Only BSNL and Airtel have coverage at Hemis. All other phones will be out of network here. For BSNL and Airtel as well, you must have postpaid connection for remaining in service. Prepaid phones do not work here or anywhere else in Ladakh for that matter. There are two ways that you can visit Hemis. The first one is that you keep a day for just visiting the local attractions in and around Leh; including Leh Palace, Shanti Stoopa, Hemis Monastery, Magnetic Hill and Gurudwara Pathar Sahib. Another way would be to take a short detour from Karu while either going towards Pangong Lake or returning from it. Majority of the people opt for the second option. Photography is allowed inside the monastery, but it is not allowed in the museum. There are lockers available to deposit your cameras and phones while visiting the museum. Washrooms are available near the monastery. You can also cover some other monasteries like Shey, Thiksey and Stok while visiting Hemis. That will mostly be all that you need to know about visiting Hemis Monastery from Leh. I hope the information above was of help. If you have been to Hemis and have some other tips that can be of help to others, please do kindly comment and suggest. If you have any questions, please feel free to ask either in the comments section below; or at our Community Forum; and I will be glad to answer.